It is with great sadness that we learnt of the passing of Prof. Michael Selby, an outstanding scientist and geomorphologist and author of the key geomorphology work “Hillslope Materials and Processes”. We reproduce below the full eulogy given by Cam Nelson, one of his close colleagues, at his funeral. Family and friends of Michael Selby, good morning to you all. My name is Cam Nelson and I was a staff member in Earth Sciences at the University of Waikato in Hamilton, New Zealand for 41 years from 1971 until my retirement in 2012. I was a close colleague of Michael during those years and today, on behalf of all his university colleagues, friends and past students, I want to share with you some aspects of the very influential role made by Michael to the University of Waikato and beyond during his working life there for 37 years, from 1965 to his retirement in 2002. This task deserves several hours to tell, but please allow me here about 15 minutes to outline some of the highlights of his working life. Michael was born in Luton, Bedfordshire, England in 1936. Following high school education at Dunstable Grammar School in Bedfordshire he was accepted into Oxford University at the age of only 17, but this academic intention was interrupted by a two-year stint of compulsory military service in the British Army where he trained as an officer and served in the military police as a second lieutenant based in Berlin, Germany. However, by age 19 Oxford beckoned again and, after briefly flirting with an English degree, Michael found his niche in physical geography – the study of landscapes – and went on to receive BA(1st Class Hons) and MA in Geography, along with a PGDip with Distinction in Education at Oxford. These degrees set him up ideally for a future teaching career involving physical geography. Michael’s relaxation time during those university days was often spent on outdoor tramping, climbing and mountaineering excursions, especially in the European Alps. Michael’s passion for understanding landforms and landscape evolution through physical geography, combined with his passion for outdoor tramping activities, came together when he emigrated to New Zealand to take on a teaching job from 1960-1963 in Geography at Christ’s College in Christchurch, where he also established and ran an Outdoor Pursuits Centre for the school at Lake Coleridge. In 1964 Michael was appointed a Junior Lecturer in Geography at the University of Auckland, but was stationed in Hamilton at a Hamilton Branch of University of Auckland. The launch of the brand new University of Waikato in Hamilton at about this time attracted Michael’s attention and future aspirations, and so he shifted across to it in 1965 as a full Lecturer and immediately became involved in building up a Department of Geography at this new university. Of course, Geography has two main subdisciplines, human or social geography, and physical geography. As a physical geographer Michael looked off into the future and prophetically envisaged possible links with a School of Science at Waikato, which was not yet even on the drawing board. To the irritation of some, Michael instigated a campaign to encourage the financially constrained Library to subscribe to many standard scientific journals and text books that would be needed should a School of Science eventuate. On reflection, what foresight and courage this took! On the recommendation of a Committee set up in 1968 to plan a School of Science at the University of Waikato it was agreed that a new subject, called Earth Sciences, would be one of the sciences taught in the new School. It was to integrate into one subject parts of traditional geology with soil science, hydrology, climatology and oceanography. The intention was to provide an academic programme about the physical Earth that would especially cater for the practical needs of New Zealand and New Zealanders. In 1969 Michael transferred out of Geography into Earth Sciences, which was to begin teaching in 1970, leaving Geography as it is today as a 100% social geography department. Michael played an absolutely crucial role in the setting up and design of the new Department of Earth Sciences, and in bringing to fruition the vision of the Foundation Professor of Earth Sciences, John McCraw. Importantly, Michael made up for some of the deficiencies in university experience that John had, he not having had anything to do with Universities since his student days 25 years before. Undeniably, the establishment of a viable Earth Sciences department in 1970 was due to the energy and forward thinking of John McCraw and Michael Selby. During those establishment years two particular academic matters stand out for Michael. First, so early in his career, he wrote a two-volume text book titled Surface of the Earth, Vol 1 published in 1967 and Vol 2 in 1971. The instant success of these physical geography text books, widely adopted by schools and universities both in New Zealand and overseas, was invaluable in immediately raising the academic profile of the new Earth Sciences Department. Second, in 1972 Michael completed the first doctoral degree of the University of Waikato with a PhD thesis about the erosion of pumice lands in central North Island. Conversion of bushland to pasture had resulted in serious gully erosion and Michael determined the factors that caused the erosion and methods by which it could be prevented. Following from his erosion studies in pumice lands, Michael went on to study landslides and other mass movement phenomena in the hills around the Hamilton Basin and elsewhere. But Michael was an extremely adventurous field man and in the ten years between 1969 and 1979 he had three summer season expeditions to the dry valleys of Antarctica, two of which he led. Here he began to expand his research interests beyond the erosion characteristics and landslides associated with soft deposits like pumice and soils into studying the nature and causes of erosion of steep hard rock slopes such as those bounding the valley walls of the Antarctic arid valleys. He then expanded upon these studies with field excursions in Africa, studying in particular the nature and origins of rock slopes in the Sahara and Namib deserts, and later in the Andes and the Himalayas. A significant outcome of Michael’s work on rock slopes was his realisation of the importance that rock strength played in controlling the diverse slope characteristics associated with different rock types in different environments. He came to see considerable merit in linking the ideas and concepts in descriptive geomorphology to more quantitative measurements in engineering geology. He developed simple portable equipment to assess the mass strength of rocks and, from this and a number of other easily assessed parameters, he established a Rock Mass Strength Index which has been adopted internationally not only by geologists and geomorphologists, but also by engineers. From a practical viewpoint, this allows simple tests to be used to estimate the likelihood of slopes, such as road batters, failing. This work led to consultancies for UNESCO in Indonesia and for mining companies in Kalgoorlie, Western Australia. It also led to the setting up of laboratories in the Earth Sciences Department for teaching Rock and Soil Mechanics, the first such in the country. I have already mentioned his two early career books (Surface of the Earth) published in 1967 and 1971. A decade later these were followed by two books in 1982 (Hillslope Materials and Processes; Landforms of New Zealand), another in 1985 (Earth’s Changing Surface), a further in 1992 (Landforms of New Zealand, 2nd ed), and finally in 1993 a substantially updated and greatly expanded (451 pp.) second edition of his earlier 1982 book on Hillslope Materials and Processes, 2nd ed. This last book is widely regarded as Michael’s major scientific work. In 2005, over ten years after publication and three years after Michael’s retirement, it was named as one of the ten “classic” books of geomorphology and its author, Michael Selby, as one of the 20 most cited geomorphologists in the English language, highlighting that Michael’s reputation extended well beyond NZ’s shores. A line in the citation for the book states “It is unique in bringing together material from many branches of the earth sciences — geology, soil science, hydrology, geomorphology and rock and soil mechanics”. Significantly, this embraces exactly the concept of Earth sciences that John McCraw and Michael Selby envisaged some 35 years previously when setting up the Department of Earth Sciences. Michael was a superb lecturer and teacher to literally thousands of students, his major contributions being in 1st year, 3rd year and Masters level classes. His refined English accent, his clearly projected voice to the back of the lecture room, his strong belief in the use of visual aids (especially 35 mm projector slides), his enlightenment with personal travel and research experiences, and his ability to ad lib without the use of notes, all gave his lectures an interest and spontaneity that students really appreciated. At the senior research level, Michael supervised the Masters or Doctoral theses of about 50 students, many of whom went on to gain livelihoods in the engineering geology and related fields. Michael was always available for public lectures as well as conference presentations. He gave on average seven public lectures a year over much of his career. These were to groups such as Probus, Rotary, 50 plus and Continuing Education, on such topics as Antarctica and the Landforms and History of the Waikato Basin, the latter typically involving him leading a follow up one-day field trip. Over and above this he regularly addressed conferences of the NZ Geographical Society, the NZ Geological Society and the NZ Institute of Engineers. Michael’s extensive knowledge and skills concerning ‘all matters that make a University tick’ became well known across the university during the 1970s and 80s. In 1986 the then Vice-Chancellor, Professor Wilf Malcolm, persuaded Michael to leave full-time duties in Earth Sciences and to join the senior administration team of the university, where he became the Deputy Vice-Chancellor. Michael continued in this role when Professor Bryan Gould took over as Vice-Chancellor in 1994, and so he held the Deputy Vice-Chancellorship reins for a grand total of 15 years through to his retirement in 2002. Fortunately for Earth Sciences, throughout this time Michael generously continued to provide a reduced load of lecturing in a couple of the undergraduate Earth Sciences courses. Michael’s duties as Deputy Vice-Chancellor were extremely diverse, far too many to list here. 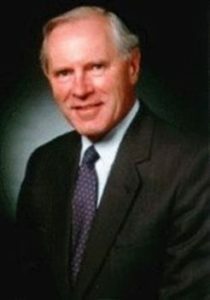 However, a special responsibility was for the University’s research portfolio in which he guided the University’s research efforts with considerable success and distinction, building significant new research strengths across a wide range of disciplines and at the same time increasing the University’s research revenue by a large and valuable margin. He built excellent relationships with the relevant funding agencies, like the Foundation for Research, Science and Technology (FRST) and the Ministry of Research, Science and Technology (MoRST), and with professional scientific and other bodies, like the Crown Research Institutes (CRIs). The University’s current high reputation as a research institution owes a great deal to Michael’s efforts. In the Senior Management Team Michael brought all his experience and good sense to bear – as a guide and mentor to more junior staff, as a role model to those seeking their own academic excellence, and as a source of wise advice to the two Vice-Chancellors he served. (1) In 1980 Michael was awarded a well-deserved Personal Professorial Chair in Earth Sciences, and was thereafter titled Professor Michael Selby. 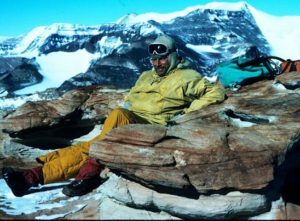 (2) Also in 1980, the naming after him of Mount Selby in the Britannia Ranges of Antarctica recognises the important contributions he made to understanding geomorphological processes in the Dry Valley regions of Antarctica. (3) In 1984 he was awarded the premier degree of Doctor of Science (DSc) by the University of Oxford for his book and journal publications to that date on rock strength. A letter of congratulations from his College (Keble) says: “This is a great honour for the College. You are its first higher doctorate in Geography and I think you are the first Geography DSc”. (4) In 1995, while Deputy Vice-Chancellor, Michael received a University of Waikato Staff Merit Award “in recognition of dedicated and expert work in conducting complex and arduous negotiations with the Crown and Tainui in respect of the University’s interests in the Tainui settlement and our lease of the campus land”. (5) Following his retirement in 2002 Michael was awarded the title of Emeritus Professor of the University of Waikato. (6) In 2005, three years after retiring, Michael’s major working-life scientific and administrative contributions to education were recognised in the New Zealand Honours List when he was made an Officer of the New Zealand Order of Merit (ONZM). Concluding, many words or phrases spring to mind in summing up Michael Selby – adventurous, inspiring, eloquent, compassionate, thoughtful, loyal, courteous, authoritative, committed, diligent, professional, and scientifically excellent. Michael, your fine legacy will live on in the many students, staff and other people you have influenced. Michael Selby atop Derrick Peak in the Britannia Range, Antarctica, 11 December, 1978. The high peak in the background at right is Mt Selby. Photo source with permission: David Lowe.